"Providing excellence in employment law so employers can focus on other aspects of their business operations." Samantha J. 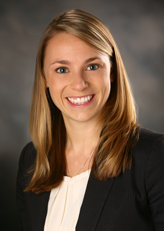 Wood is an associate attorney at Lindner & Marsack S.C. Her practice covers a broad spectrum of labor and employment issues, including wage and hour, employment discrimination defense, unemployment compensation, immigration, family and medical leave, workplace health and safety, restrictive covenant agreements, collective bargaining, and labor arbitration. Coming from a family of small business owners, Ms. Wood understands the stresses employment law and litigation can have on a business. As a result, Ms. Wood strives to provide excellence in employment litigation and advice so employers can focus on other aspects of their business operations. Prior to joining Lindner & Marsack S.C., Ms. Wood focused primarily on labor and employment and general litigation matters. She represented clients regarding discrimination complaints, restrictive covenant enforceability, partnership and contract disputes, and workers' compensation and unemployment compensation matters.